As Secret Avengers #14 begins, Taskmaster is dead! Our hero, my Deadpool stand-in, has served S.H.I.E.L.D. well, but alas he was one step behind the one who betrayed him. And one agent gets the answers to the question that has been bugging her, who am I? Taskmaster is dead and the Scientist Supreme shows Mockingbird how much he knows about this Secret Avenger. 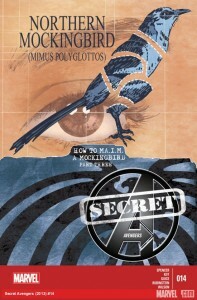 And there are some dark secrets haunting Bobbi Morse that are now explained to her and the reader. Meanwhile on a S.H.I.E.L.D. helicarrier, Agent Hill and M.O.D.O.K. continue their dance! And deep beneath the waves, Fury's field team prepares to arrive at their next location at the hands of their captors, A.I.M. Island. I have a concern! Where is Daisy Johnson? What is she up to? Where has she been? Is the hero she has linked up with going to help her against Agent Hill? Okay, here is my real question, are we as readers being asked to forget about her? This issue is part 3 of 5 of “To MA.I.M. a Mockingbird.” At its conclusion Nick Spencer leaves the title and Ales Kot takes over alone as writer under the title re-launch in the All-New Marvel NOW! That issue is to serve as a entry point for new readers. So I am assuming that something new will be occurring at that point. Me, I just want to know where Daisy Johnson is? Is that too much to ask? Seriously, as a faithful reader to this title should I be worried that there will not be the time to wrap up the Johnson/Hill struggle that is been going on for nearly a year? Nick Fury Jr. in this issue shows himself to be focused. Seriously, he takes on a challenge that his teammates, card carrying Avengers at that, will not do. Man he is one tough dude, and you have to give him credit for being a chip off the old man. Seriously, where is Daisy? The only appearance of Nick Fury in this title was to scheme with her. That moment needs to mean something in this title! Overall I felt like this was a middle issue of an arc, which it is. It was slow on action. It had plently of dialogue to reveal a mystery or two to us. And overall, I would rather have the missing Daisy Johnson scenes than the M.O.D.O.K. scenes because I feel like she has a better shot at toppling Hill than M.O.D.O.K. reclaiming A.I.M..
Wow, I guess the whole theme for me was, where's Daisy? She has been absent since Secret Avengers #9! Yes, I want to see “How to MA.I.M. a Mockingbird” play out, but we need to resolve all of our cliffhangers instead of letting some slip away! Seriously, this isn't Heroes! Irish girlfriends just don't get left in alternate timelines forever you know!